"Translated by Karin Heger, Edited by Susan Wenck"
between the Original Ragdoll and other felines currently being classified or sold as “Ragdolls”. purchase animals from that particular breed and had register the offspring on the Dayton genetic card. only way to keep the breed pure. background information has been a reason why new-color Ragdolls are in the majority today. refresh the breed with fresh blood and/or to achieve more mass or size. remember anymore what it means to breed Original-Ragdolls, and what the real purpose is. both parent cats are listed in the database, then, and only then can his Ragdoll be declared an Original-Ragdoll. Ragdolls because their ancestry cannot be completely traced in the Denny Dayton database. 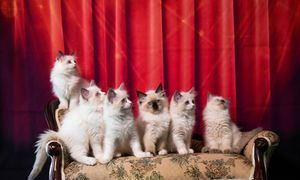 breeders of the Original-Ragdoll cat.